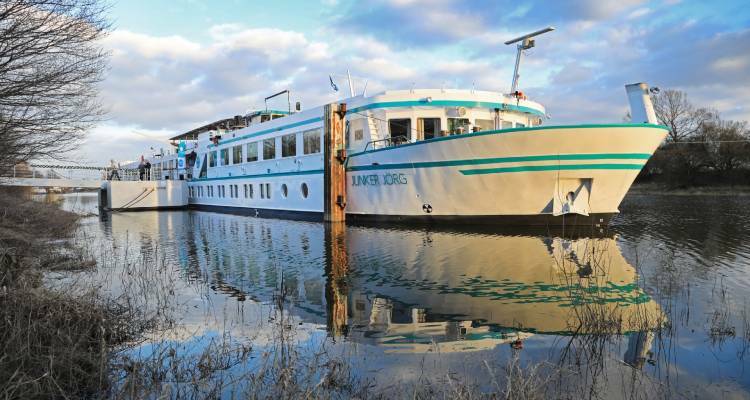 MS Junker Jörg, which was built especially for the waterways around the Elbe, has been extensively renovated in recent years and now scores with an attractive and contemporary ambience. The hospitable atmosphere will let you enjoy every minute on board. The comfortable hotel ship has a total of 56 external cabins on two decks, eight of which are large suites. All cabins are comfortably and tastefully furnished and equipped with air conditioning and heating, carpet, a safe, telephone, flat TV and bathroom with shower and WC. The 12 m² cabins are equipped with separate beds. All cabins have windows that can be opened. The 16 m² suites have a double bed and a French balcony. You can relax in one of the outside cabins or marvelling at the passing landscape from the panorama salon with bar. If the weather is fine, a generously dimensioned, partially covered sun deck with chess board, deckchairs, chairs and tables is at your disposal. In the evening you can end the day with piano music, or you can browse a little in the on-board library. The 16 m² suites have a double bed and a French balcony. All cabins have windows that can be opened. In the stylish panorama restaurant the warm ship crew spoils you with tasty international and regional delicacies.